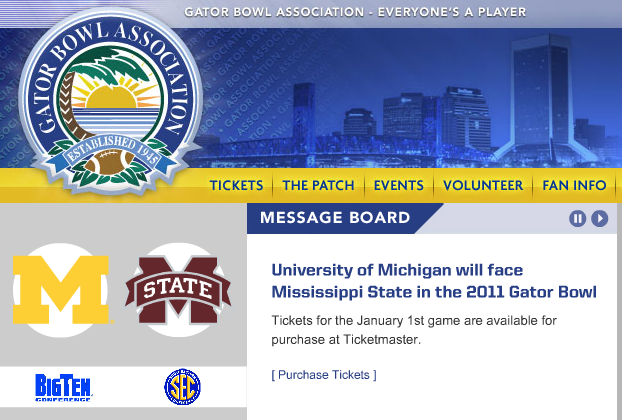 Just as the title says...Michigan will travel to Jacksonville to play against Mississippi State in the Gator Bowl on January 1st. My take is this is absolutely great. I can't say that I'm crazy about playing Mississippi State, but I'll take a New Year's Day bowl after a 7-5 season any day. Four teams in the Big Ten finished 7-5 this year, Penn State will head to the Outback Bowl to play Florida on Jan 1, and Iowa will likely head to the Insight Bowl on Dec. 29 to face a Big 12 opponent. Northwestern heads to the new TicketCity Bowl and plays Texas Tech on Jan. 1 at the Cotton Bowl in Dallas. Illinois, who finished 6-6 will play Baylor in the Texas Bowl on Dec. 29. Tune into the BCS Countdown Show tonight at 8PM on ESPN, and the Bowl Selection Show at 9PM to see who is going to which bowl. The matchup pairs two spread offenses and two coaches (Michigan's Rich Rodriguez and Mississippi State's Dan Mullen) who run the system extremely well. Michigan quarterback Denard Robinson and many of his teammates return to their home state of Florida. I'm guessing Michigan would rather be seeing Tennessee in the Gator Bowl, as Mississippi State hasn't lost to a team ranked outside the top 20. This will mark the first meeting between the schools, while Michigan is 7-3 against the SEC in bowl games.